Robert writes eclectic and informative articles about a variety of historical subjects including unusual events and people. 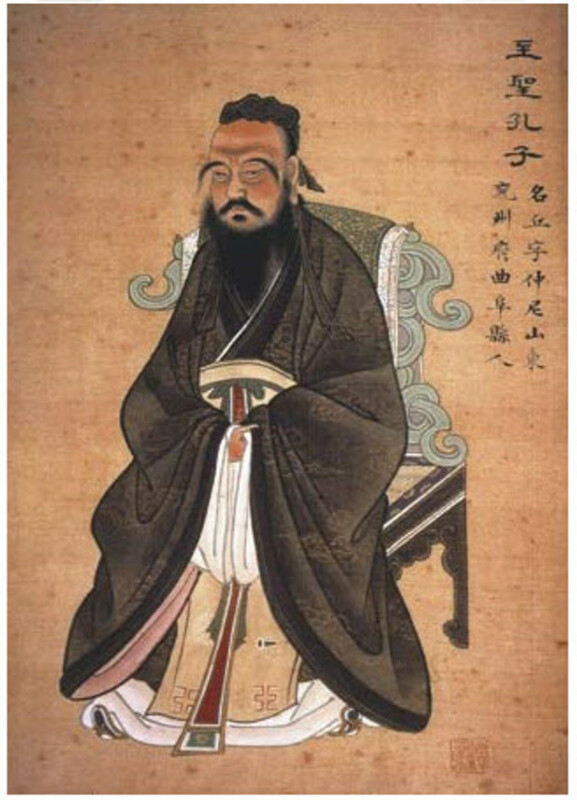 This article is about the legends and myths surrounding the birth of Confucius. 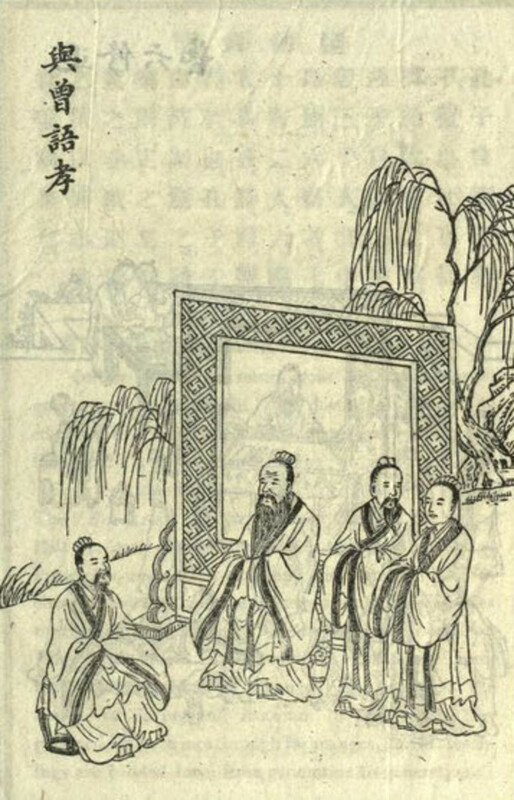 Although Confucius never claimed to be supernatural, and is famously recorded as having said "Respect the gods, but keep them at a distance," later generations came to regard him as divine. 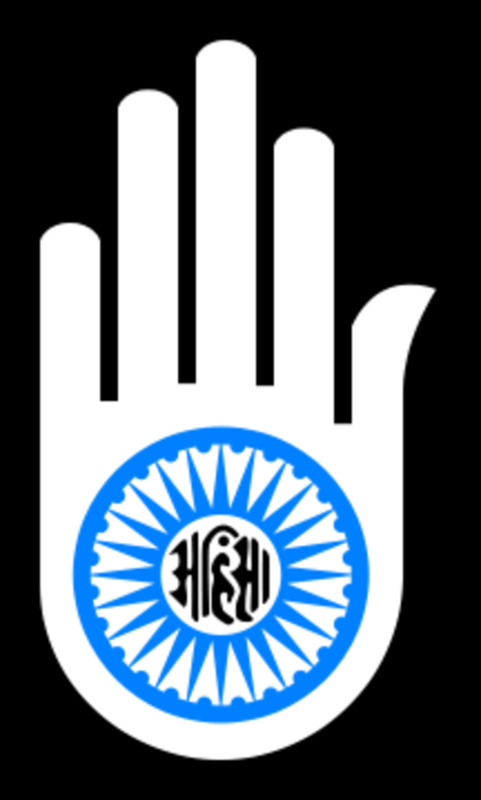 Legends sprang up concerning his miraculous conception and birth. According to legend, Confucius's mother was the much younger second wife of a seventy year old man. This man was a government official and descended from kings. He had a wife, and a concubine, and a bevy of unwanted female children whose names history does not bother to record. 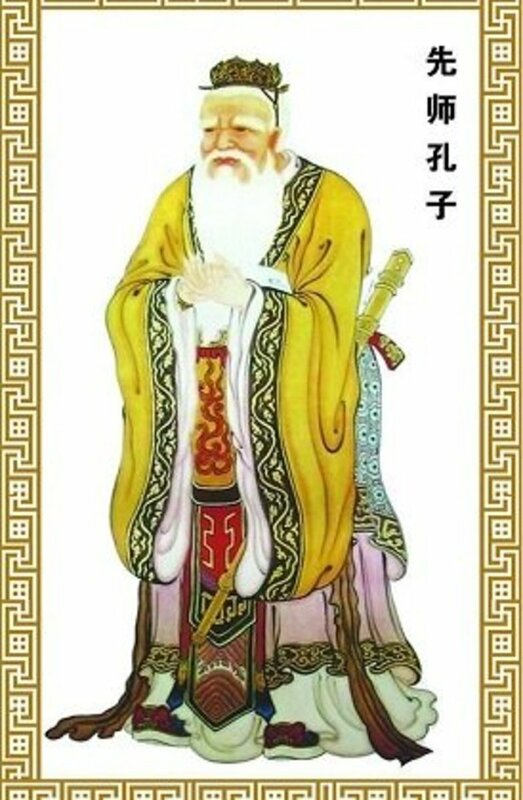 His wife had given him nine daughters, and his concubine had borne him a son named Mon-P'i, but the son was crippled in the legs and not much use to Confucius' father, who sought a son to carry on his illustrious family name. It is a commentary on history that the name of the unillustrious and unwanted oldest son of Confucius's father is recorded and known almost 3000 years later, but we know nothing of Confucius's sisters. So Confucius's father approached a man named Yen, who had three daughters of marriageable age. He asked for one in marriage, it did not matter which. The girls' father spoke to his daughters: "This mandarin is from a family of scholars, and numbers kings among his ancestors. He is ten (!) feet tall, and though advanced in age he is still strong. Which of you will consent to be his wife?" 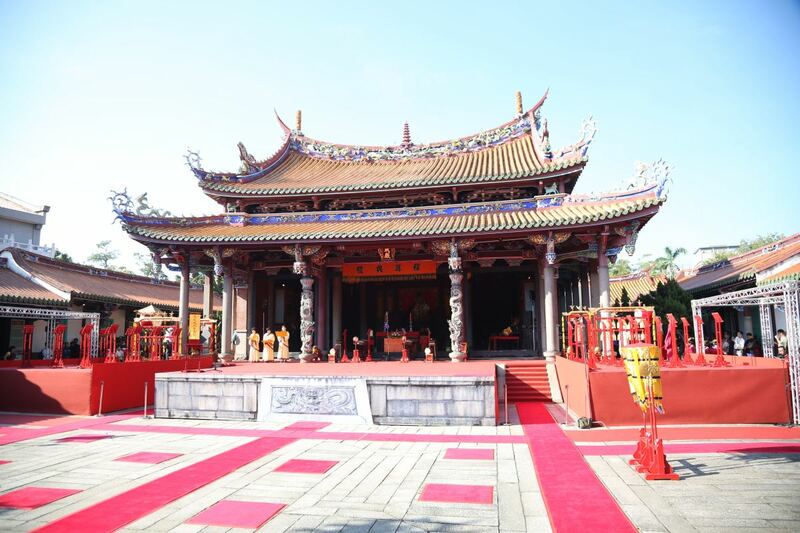 The two eldest daughters hesitated at marrying this decrepit old scholar, but the youngest daughter, named Thcheng-tsai, obediently replied: "The will of my father is sufficient, what need is there of my consent?" And so this old man concluded the bargain with Thcheng-tsai's father and acquired himself a wife, to add to his collection of wife and concubine. It had cost him some dowry money, and though he was still hale and hearty he knew that time was running out to sire a healthy son. And so Confucius's father set about the task of impregnating Thcheng-tsai, but unfortunately she did not get pregnant. It was all too obvious to Confucius's father that the fault lay with his nubile young wife, and not his decrepit, passed-expiry date body. Thcheng-tsai bore her great shame stoically, but her failure to produce a son, lowered her standing within the family; even the concubine, who had only managed to produce a crippled boy laughed at her; at least her defective offspring was a male. 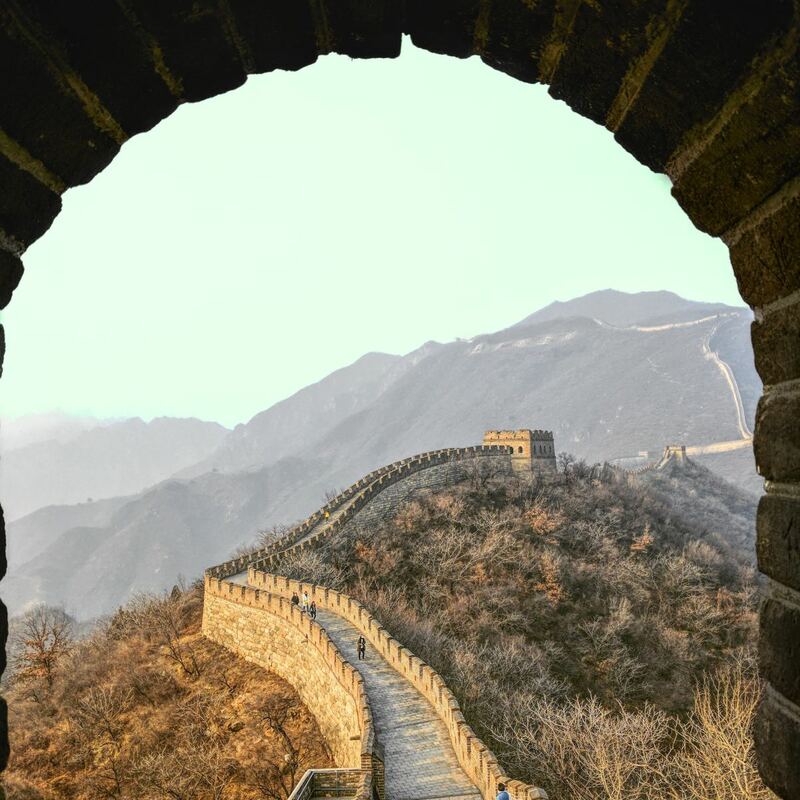 What is Confucianism is and how has it has influenced Chinese culture? 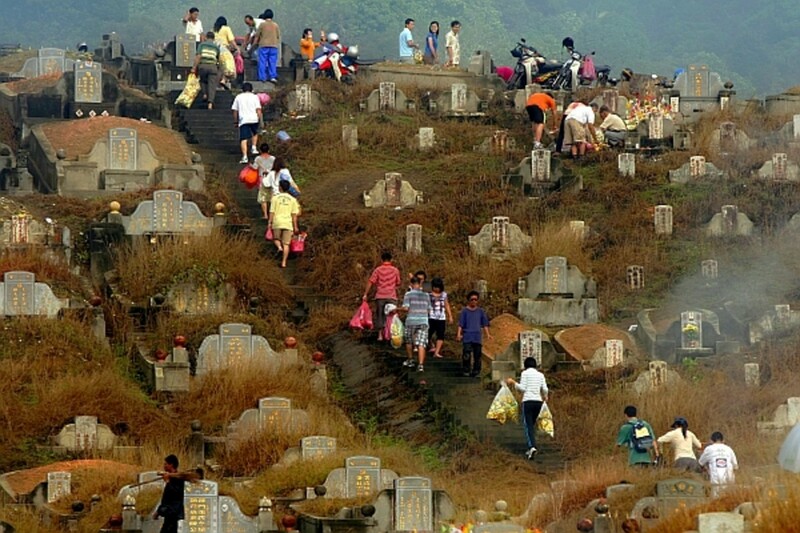 So Thcheng-tsai decided to make a pilgrimage to the top of a sacred mountain, which rose some distance from her home, in order to ask the gods for a son. 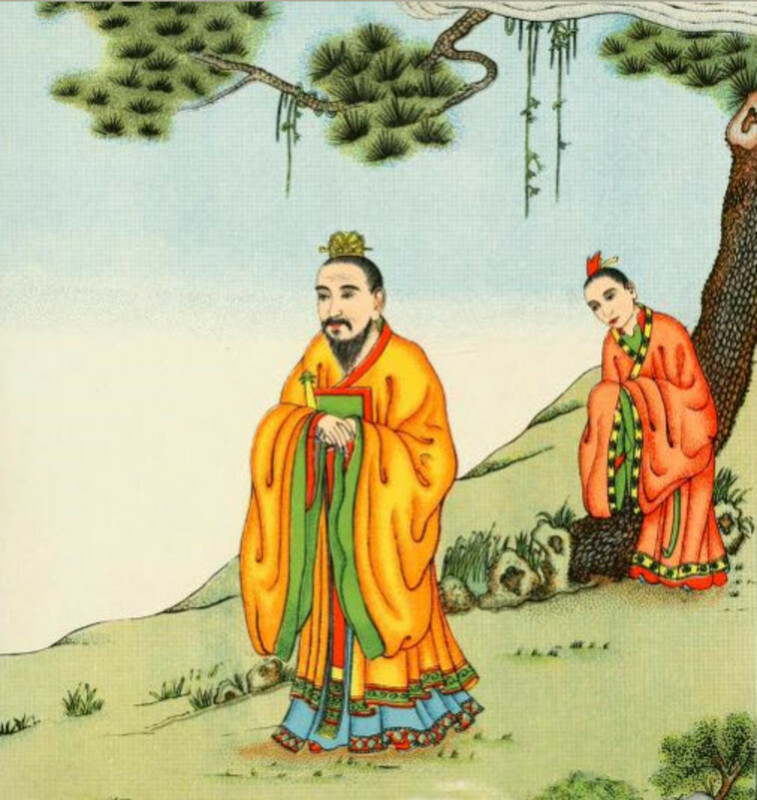 As Confucius' mother climbed the mountain, there were signs that her prayers might be answered: on her way up, all of the vegetation pointed upward and as she descended, all of the plants drooped towards the ground. Later, when Confucius was born it was noticed that the top of his head was concave, just like the summit of the sacred mountain, which bolstered the belief that his mother's prayers had been answered on the summit. Soon afterward Confucius' mother learned that she was pregnant. This was a great joy as well as a source of great worry for the woman: if she bore a son, her standing within the family, and her relationship with her husband would be secured; it were a girl, baby and mother would be ostracized, perhaps even driven out. Good boy, unicorn. Now give me the jade tablet. Good unicorn. My God! It's a Unicorn! One night, a unicorn came to visit the woman who would be Confucius's mother. The unicorn carried in its mouth a jade tablet which announced: "Son of Choie-tsing-tse. King without scepter from the decadence of the Tcheou." 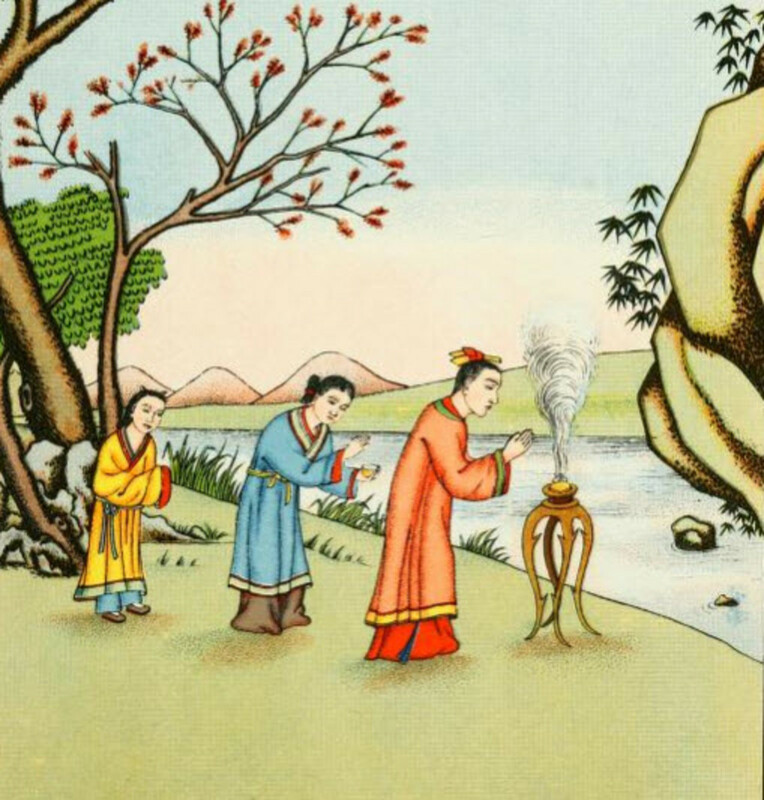 Choie-tsing-tse is the personification and spirit of water, one of the five elements, and also the god of the planet mercury. Things were looking up, thought Confucius' mother. This was surely going to be an awesome birth. It must be a boy; gods did not claim parentage of baby girls and Unicorns were not known to drop in to announce the birth of girls. 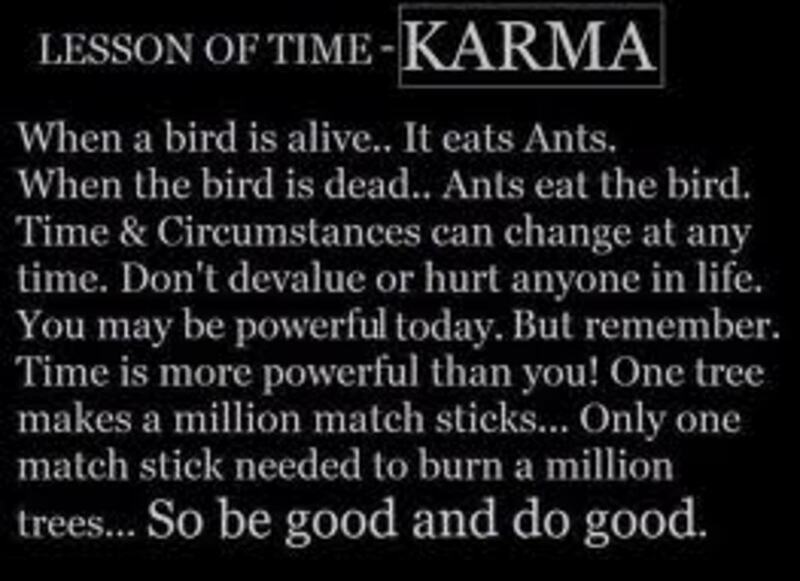 But the gods were not done with their signs and portents. 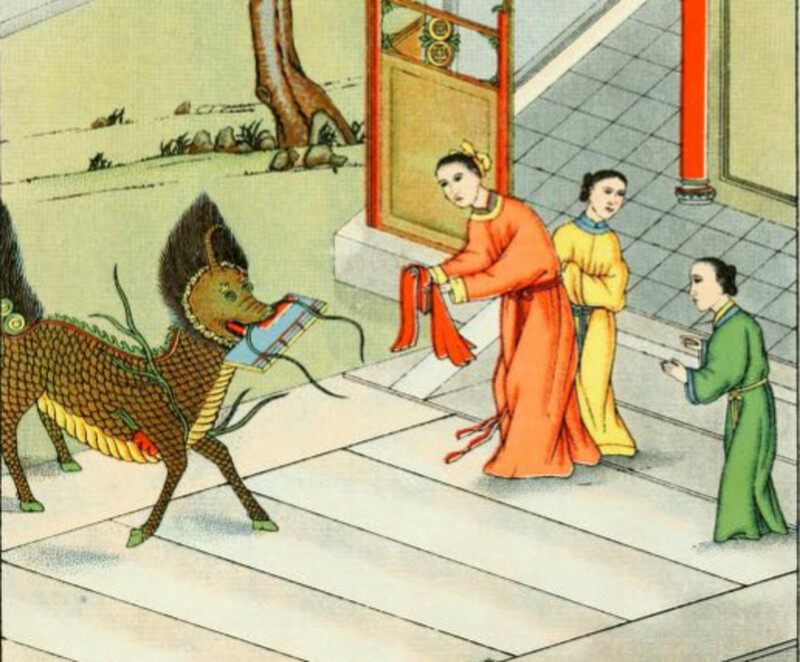 As if a unicorn and pointing vegetation were not enough, the night that Confucius was born two dragons encircled the house. 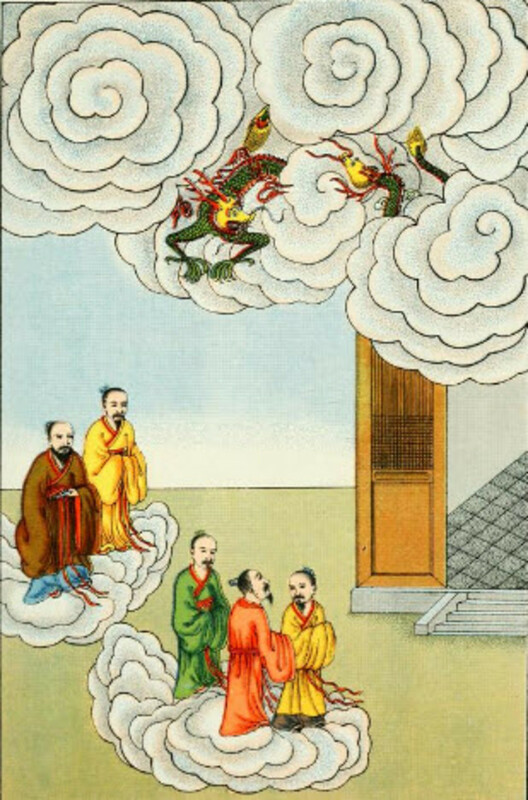 And then Choie-tsing-tse and the other four gods of the Five Planets (Mercury, Venus, Mars, Jupiter, Saturn), the so called Five Old Men descended from heaven and began singing a heavenly chorus announcing the birth of Confucius. It was a veritable bestiary of heavenly visitors. Apparently this was not enough to drive home the point that this was a heaven sent child so the message appeared on baby Confucius's chest: "His doctrine shall be the law of the world." 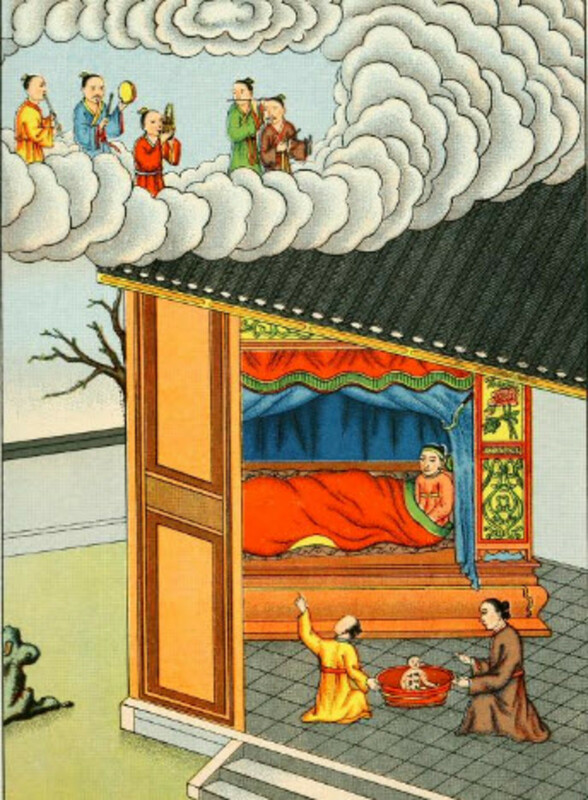 It is not recorded how Confucius's father felt about being cuckolded by the god of water. Soon afterwards, when Confucius was only three, the bio-dad passed away leaving Confucius destitute, but with a marvelous future ahead of him. His teachings would shape a nation; and after his death, Confucius would be worshipped by millions as a divine teacher and benefactor. Thanks for the feedback. Yes, I found some of his views to be extremely misogynistic, which is why I had a bit of a satirical tone in my depiction of his supposedly miraculous birth. Quotations you sure write on a wide variety of topics. I have always wondered why Confusius had such a low opinion of women.From the info on your hub it looks like he was just a brilliant man of his time.